_Underscore_, Other Virtual Intrument from StudioWeapon. 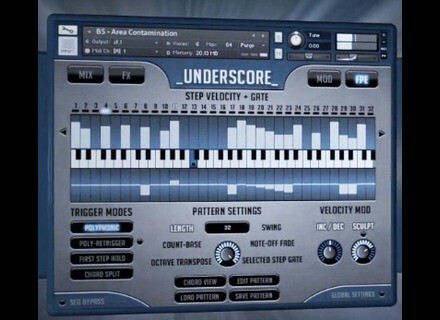 StudioWeapon, a new sound library editor, announces the release at the end of the month of _Underscore_, a virtual instrument for Kontakt. _Underscore_ is intended for cinematic composers and features real time editing and creating tools. 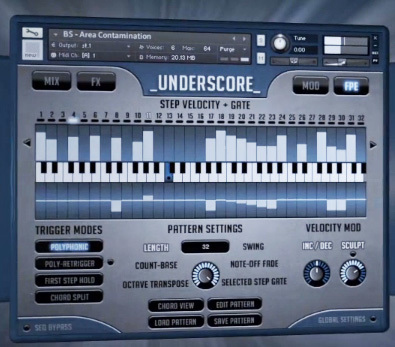 StudioWeapon announces the presence of a FluidPhrase engine (32 steps polyphonic sequencer, 5 trigger modes) and phrase envelopes, as well as a multi-layer architecture (five in total) with a dedicated mixing section (with enveloppes and crossfader), an effect section with 18 filters per patch, flanger, chorus, phaser, compressor, EQ, convolution processor... and a modulation section with 4 phrase envelopes, 58 destinations and 4 Flex Modulators. www.studioweapon.com website is not active yet, and the price is still to be announced. We'll have to wait until May 31st to discover _Underscore_. A new Xils-Lab synth is on the way Xils-Lab will launch next week the new Xils V+ virtual synth modeled on a vintage instrument. Traktor DJ available on the iPhone Following the iPad version, Native Instruments announced the availability of its Traktor DJ app on the iPhone and iPod Touch. Sugar Bytes Turnado available on iPad The famous Sugar Bytes multi-effects software is now available on the AppStore for the iPad.